Sleeping Tree Sap is a potion that gives the player a drug-like effect. It slows down movement for 25 seconds and increases health by 100 points for 45 seconds. In addition, it provides the unique effect Drugged for 45 seconds. This effect causes the player's screen to be tinted purple and become blurry. There are no other known side effects to drinking the sap. It appears to be legal in Skyrim, unlike skooma. It possesses the most powerful narcotic effect in the game, as no other potion or ingredient provides the Drugged effect when consumed. After completing the quest Sleeping Tree Cave, Ysolda in Whiterun will buy the sap for 150 gold. The legal Sleeping Tree sap is much more difficult to obtain than the illegal skooma. 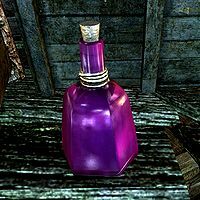 The only merchants who sell the sap are randomly encountered skooma dealers, who always carry two bottles. It is however the only drug that can be created by the player. Using the spigot attached to the Sleeping Tree at Sleeping Tree Camp will produce one vial of Sleeping Tree sap. Additionally, with the Dawnguard add-on installed, one sample can be found sitting atop the first alchemy lab within Redwater Den.